Leonard Slatkin has programmed at least one Mahler symphony in recent seasons: no. 1 in 2007, no. 8 in 2006, no. 9 in 2005. If you add those to the not insignificant number of Mahler performances we have reviewed over the same period, we might seem ungrateful to complain. In fact, this season alone, Iván Fischer will lead a Mahler second with the NSO in April, and this weekend there was an all-Mahler program to appease our lust for the Austrian composer's music. And yet, few would consider Slatkin a leading Mahlerian among living conductors, an impression that was not contradicted by Friday evening's performance, mostly good but no more, and occasionally deficient. 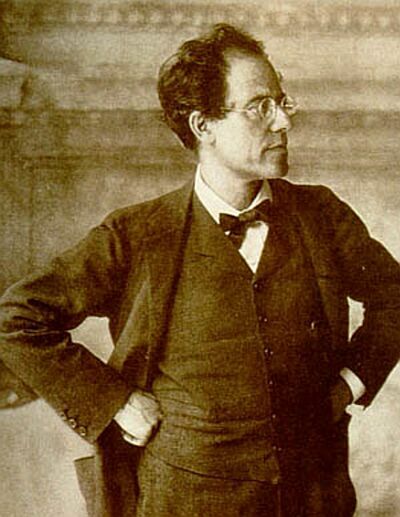 The programming receives no complaint, combining two works conceived almost in tandem, the Kindertotenlieder, completed by Mahler in 1904 during a lull in his composition of the other work, the 6th symphony, during what was by all accounts an idyllic and blissful summer in the Carinthian mountains. A setting of five poems by Friedrich Rückert (1788-1866) on the deaths of his two young children, Kindertotenlieder was something Mahler later admitted he could not have written after losing his own daughter, and for any parent the subject is unapproachable, unmentionable, inconceivable. Like Mahler, who in moments of superstition worried that by composing this song cycle he had somehow caused his daughter's death, becoming a parent has made this music much harder for me to hear. The chance to hear the incisive and silken baritone of Thomas Hampson, a renowned and by now vastly experienced performer of this cycle, was certainly a draw. Anne Midgette's claim, in her review, that Kindertotenlieder is "mezzo-soprano territory" is a mystery. While there are several excellent recordings with mezzo-soprano and the cycle can certainly work with a female voice, Mahler himself conducted the world premiere of this cycle with a baritone, Friedrich Weidemann, in Vienna in 1905. Furthermore, the poet wrote from his experience as a grieving father and in at least one of the songs (no. 4, When your mother steps into the doorway) the narrator is specifically male. This performance should have been emotionally devastating, but the NSO could not seem to contract and expand elastically with Hampson. In some cases, this appeared to be the fault of Slatkin, who opened some of the songs at a tempo far away from what Hampson had in mind. In others, Slatkin's beat was right with Hampson, but the chamber-like sensibility of the reduced forces (mostly winds and strings) was sadly lacking. What an extravagant waste of Hampson's voice. The results were better but still mixed on the second half with Mahler's Symphony No. 6, arguably the bleakest of the composer's corpus. Jens has generally favored a darker, even cruel approach to the sixth, at one point recommending Iván Fischer's recording and expressing reservations about Claudio Abbado's live recording (a work Abbado has also performed at the Lucerne Festival). Most Mahler-lovers have opinions about what version of the symphony is best, and Slatkin made his own choices. Mahler conceived the sixth symphony with the inner movements in the order of Scherzo-Andante, but decided to reverse that order in the earliest performances. 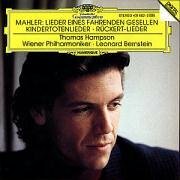 Since Mahler published both orderings at different times (the Dover study score I consulted has Scherzo-Andante and three hammer-blows), opinions are sharply divided, even at the highest levels of Mahler scholarship, and thus it seems to me that neither version could be described as authoritative. The critical edition opts for Andante-Scherzo (with reservations from recent research and the noted scholar Henry-Louis de La Grange), which many conductors including Slatkin choose. (See also the survey of recordings by Tony Duggan.) Myself, I can live with either choice, but to my ears the Scherzo does seem to fit better, thematically and by key relationship, in the second position, closer to the march, and the slow movement serves better as an introduction to the finale. The A and B thematic areas of the first movement oppose a weighty march with blaring brass (generally fine in this performance) and a lush and tender evocation of Mahler's wife, Alma, at least according to her sometimes unreliable recollection. The love theme seemed to rush by (it is marked Schwungvoll but still) in Slatkin's driving interpretation, although a beautiful, mysterious stasis was allowed to descend on the cowbell section introduced in the development. Having already shared my memories of hearing the sound of echoing cowbells in the Swiss Alps during the summer I was writing my doctoral dissertation, I can tell you that the sound is instantly evocative of that mountain setting. Slatkin hit on a good tempo for the Andante moderato slow movement, although the orchestra was again not always together with him. The folksy chromatic inflections of the melodies were handled tastefully, and there were well-played solos from the oboe and horn. The opening of the Scherzo was troubled by ensemble misalignment, too, although by the time Slatkin got to the Trio, the interpretation had settled into place, making this a pleasingly herky-jerky, lopsided Ländler. Far from being a comic or grotesque dance, it was clumsily sweet. It was the fourth movement that stood out as the high point, most notably by restoring the third hammer-blow at measure 783, removed by Mahler from later versions of the sixth symphony. Here, too, the four harps showed how they can produce sounds both transcendent and menacing, the latter in the introduction's sinister descending chromatic line that returns just before the final stroke of the hammer-axe that kills the hero of the symphony. The gigantic wooden sledgehammer wielded by the percussionist, striking a slab on a desk at the far right of the stage, had an ideal sound for what Mahler reportedly wanted ("short, mighty but dull in resonance, with a non-metallic character, like the stroke of an axe"). This was surely not a consolation for the poor last chair of the second violin section, who not only had to wear earplugs but cowered with his hands over his ears at all three strokes. I am in Jens's camp on the subject of the three hammer-blows, too, and Slatkin's fourth movement provided an excellent sound justification: the first two strikes are prepared in the score, almost as if anticipated by the hero, helping him to survive them. The third, however, comes out of nowhere and is devastating, felling the hero like a tree, as Alma put it. Whether or not Mahler saw his own future woes in the three hammer-blows, it made for an exciting and worthy conclusion for this symphony. This program repeats this evening (February 2, 8 pm). This week, the National Symphony embarks on an American tour, playing on Thursday at Carnegie Hall (February 7, 8 pm), and several concerts and educational events in South Carolina. The orchestra returns to Washington for a special benefit concert, at which guest conductor Christoph Eschenbach will introduce young violinist Erik Schumann (February 26, 8 pm). "Mahler conceived the sixth symphony with the inner movements in the order of Scherzo-Andante, in which form the piece was premiered and initially published." While I agree with you about the reasons for the order S-A, I'd like to point out that Mahler never conducted the symphony with that movement order... that from its premiere under Mahler in Essen onward, it had always been performed A-S. The S-A order wasn't picked up until Erwin Ratz, founder and editor of the IGMG, started campaigning on behalf of it and convinced Mitropoulos to change the order back to S-A. The IGMG then published the critical edition in 1963 with that movement order. Many conductors resisted that idea... (Del Mar, Rattle, Barbirolli) others embraced it and still do (Zander), other embraced but have reverted (Slatkin, Jansons, Abbado, Mackerras). While it is true that HLG suggests S-A (he's my straw to which I cling on this issue :-) ), the new critical edition now categorically states: A-S... and HLG has climbed down from some of the claims he cited in support of S-A. Thanks, Jens. I see that my notes had an error that made it into the review. Correction made. The Critical Mahler Edition now unequivocally states A-S. The Mahler Edition also states that there is no choice in this matter... which I rather disagree with, because I think a good S-A case can still be made. MTT, who may not have had access to the IGMG's paper when he recorded the 6th right after 9/11 (what concerts those must have been! ), takes the Scherzo first -- and again I'm just in awe of how the Andante, just as you say, prepares for the Finale. It's like the rest before the ascent!